Have you heard the one about the live snail with a carbon-14 age of 3000 years? Or the lava erupted in 1800 in Hawaii with a potassium-argon age in the millions? It’s all true, true I tell you. But does this signify a major problem with radiometric dating? I don’t know who first dug up these examples, but they were popularised by the creationist comic-book writer Jack Chick, in a publication called “Big Daddy”. The first page, available here if you’re lucky (the links to Chick Publications only seem to work at random), shows a well-primed creationist student arguing with a singularly ill-informed biology professor. The professor has been leading such a sheltered life that he’s never met these creationist arguments before. And he doesn’t understand anything about evolution or dating of rocks or embryology or indeed anything else. Surprise! the student wins! A skilled cartoonist, Jack Chick manages to squeeze the largest number of fallacies into the smallest number of words. There is a crib sheet at the end of this post, listing all the fallacies I spotted myself; I just reached double figures but there may be more. So Jesus must be the force that holds the atomic nucleus together. Convinced by this reasoning, the Professor accepts Jesus, announces that as a result he can no longer teach evolution, and is sacked. Jack Chick, by the way, has just published another comic book at the age of 92. In it, a bright young man from a good Christian (i.e. creationist) home is seduced by Satan into believing in evolution, and when we last see him is heading straight for damnation. In the words of one of Satan’s many horned helpers, “Joe trusted evolution, not God, and became a jobless party animal.” And a criminal and a drug addict, and covered himself with tattoos, and died and went to hell. Tragic, and so easily avoidable. I never managed to get to Page 13 of Big Daddy, which is what we really need; link (if it works for you) here. It didn’t work for me, but you’ll find a description of the contents by someone called Honus at talkorigins, and I’ve seen some of the relevant cartoons reproduced elsewhere. So you can either take Honus’s and my word for it, or go online to Chick Publications and buy 25 copies (minimum purchase) of the tract, which I am not about to do. The really remarkable thing about the tract is that it actually gives the primary literature references to the results that is discussing. And the briefest perusal of this primary literature will show why the papers that Chick refers to, far from undermining radiometric dating, actually reinforce it. That snail was not 3000 years old, but that really was its apparent radiocarbon age, because it was exchanging calcium carbonate in its shell with mineral calcium carbonate. And that makes all the difference, so you need to take such features of the environment into account. Many readers will be familiar with the principle of carbon-14 dating. Carbon-14 decays with a half-life of 5730 years. Nonetheless, the fraction of carbon-14 in the atmosphere stays roughly constant (or did before we started adding to it by nuclear weapons testing, and diluting it with carbon dioxide from fossil fuels). That is because the upper atmosphere is bombarded with cosmic rays, which cause nuclear reactions that convert nitrogen-14 (stable) to carbon-14. Mixing distributes this radiocarbon through the atmosphere, where it is taken up by plants and, in due course, animals. As long as you are alive, you are part of the circulating pool of carbon, but as soon as you die, the carbon-14 in your body starts decaying. Of course, cosmic ray intensity is not really constant over a long period, but we can calibrate carbon-14 dates by comparison with carbon in tree rings (dendrochronology). The tree ring correction is small for most purposes, but matters for things like precise dating of Egyptian dynasties. The point, of course, is that the carbon in the lettuce being fed to the snails is part of the general pool, but the carbon in calcium carbonate minerals is radiochemically dead, having been out of circulation for a long time. What the paper really showed was that the snail exchanges carbonate in its shell with carbonate from dissolved minerals, giving a spurious depletion of radiocarbon in the snail. You will find the story in Science, 1963, p. 637 (paywall, sorry, but summary here). What about these rocks in Hawaii? Here again the paper is behind a pay wall, but if you follow this link it will take you to the title and abstract, which is all you need. In fact, the title alone is all you need: “Radiogenic helium and argon in ultramafic inclusions from Hawaii”. Inclusions. And in case that’s not clear enough, the abstract tells you that the work is all about the dating of xenoliths. Xeno- foreign, as in xenophobia; lith rock, as in monolith. Look at the paper in more detail, if you can get access to it, and you will find that the excess argon is only found in bubbles of fluid within the rock, that bits of rock that aren’t bubbly don’t show any, and that there is circumstantial evidence that the argon comes from deep within the Earth’s mantle, not radioactive decay in the lava itself. Anomalies happen all the time in geology. They are, in the original sense of the expression, exceptions that prove the rule; if there were no rule, we would not consider them exceptional. Uranium-lead and potassium-argon dates of rocks usually agree, but not if the rock has been so strongly heated that argon gas can escape. Whole rock dates can be misleading, as in the example of the Hawaiian volcano, if the rock has been contaminated from some source, in this case fluid from the mantle. So far from undermining the method, these anomalies add further information about the sample. In much the same way, radiocarbon dates will be anomalous if some of the carbon comes from inorganic sources, as in the case discussed above, and the anomaly might even be used to tell us something about the specimen’s history and diet. Now here’s the bit that I really don’t understand. What is going on in Jack Chick’s mind, when he gives us this stuff? I assume that he is an honest person of goodwill, who is doing his best. He really believes that because I and most readers here accept the fact of evolution, we are going to be punished in hell for ever. Being a kindly man, he really doesn’t want that to happen, so he is doing his very best to convince us of the error of our ways. So why does he do it by pointing us towards papers that say the very opposite of what he says they say? I can only speculate that this is the result of what psychologists call confirmation bias, which leads to interpreting new information, however perversely, in a way that supports what you already think. And when we come to creationism, the motivation for bias is extreme. Remember that we are talking about people who really believe (a) that if you don’t accept salvation through Jesus you are going to go to hell, and (b) that the doctrine of salvation through Jesus only makes sense if the biblical Fall is a historical fact. The papers I’ve mentioned above show that under certain rather special circumstances, radiometric dating will give you the wrong answer unless you take those circumstances into account. Young Earth creationists, knowing that their entire worldview depends on refuting radiometric dating, pounce on these examples as evidence that the method is unreliable. Which of course it is, if you don’t do it right. So what? All of which gives me uncomfortable pause for two reasons. If creationists are so blinded by confirmation bias, what hope is there of reasoning with them? And if I see my intellectual opponents displaying confirmation bias, completely oblivious to what they are doing, what makes me think that I am any different? h/t Sensuous Curmudgeon for tip-off about Jack Chick’s latest. Whale ancestors illustrated (Ambulocetus and Pakicetus) copyright JGM Thewissen; may be reproduced for non-commercial educational purposes. Crib sheet: Definition as obfuscation. Misdefinition of science to exclude all indirect inference (although even Young Earth creationists accept the fact of an Ice Age on geological evidence). Macroevolution, if the word means anything, means major change, and this takes more time than we have been watching. So of course we’ve never seen it. Similar fossils do indeed imply similar ages, but the order of these ages has been known for nearly 200 years on the basis of stratigraphy, and absolute ages established for over 100 years now by radiometric dating. 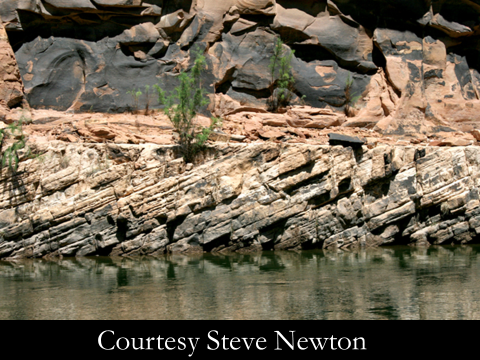 Polystrate fossils were explained in 1868; the explanation is much the same today. New Scientist really did point out in 1997 that it is silly to carry on using Haeckel’s highly questionable drawings, as some still do, when we now have a much more detailed information. But, as explained in Alice Roberts’s Incredible Unlikeliness of Being and many other places, the gill folds on the human embryo really are homologous to the folds on that of a fish. They just develop rather differently, explaining such oddities as the tortuous path of our vagus nerves. As for the whale’s pelvis having “nothing to do with walking on land”, by 1999 we already had extensive series of fossils linking whales to their terrestrial ancestors; there is an excellent review here by one of the scientists involved in Evolution Education and Outreach (free download), and whales evolution also features in an excellent video here . The development of secondary functions (exaptation) is commonplace. Thus mammals’ ear bones are vestigial relics of reptiles’ rear jawbones. Creationists often argue, as here, that natural selection can only remove, and not add. This riddle was solved 120 years ago, with the discovery of mutation. Mutations supply novelty; selection winnows it. Creationists agree in explaining away pre-modern human fossils, such as Lucy and numerous others already known by 1999, as being either apes, or humans. Unfortunately, they can never agree on which is which. And, something that I think believers in particular should find offensive, the theological absurdities of the final frame.